Happy humpday loves! It's officially my Friday, woohoo! 2015 is officially coming to an end and I'm excited to see what 2016 holds! I can remember how much I used to look forward to going out and celebrating New Year's Eve a few years ago; getting all dressed up, cocktails, dancing, the anticipation of midnight but recently I've enjoyed more low key celebrations. Don't get me wrong, that doesn't mean I don't like to add a little extra sparkle to my wardrobe though! This blazer from SheIn is the perfect touch of sparkle to any outfit whether you're going out on the town or just to dinner. It can spice up a boring little black dress (ok, who am I kidding. We all know I never think a little black dress is boring) or it can glam up a pair of destroyed denim jeans.Since I'm not doing anything super fancy I decided to keep my NYE look a little more casual. 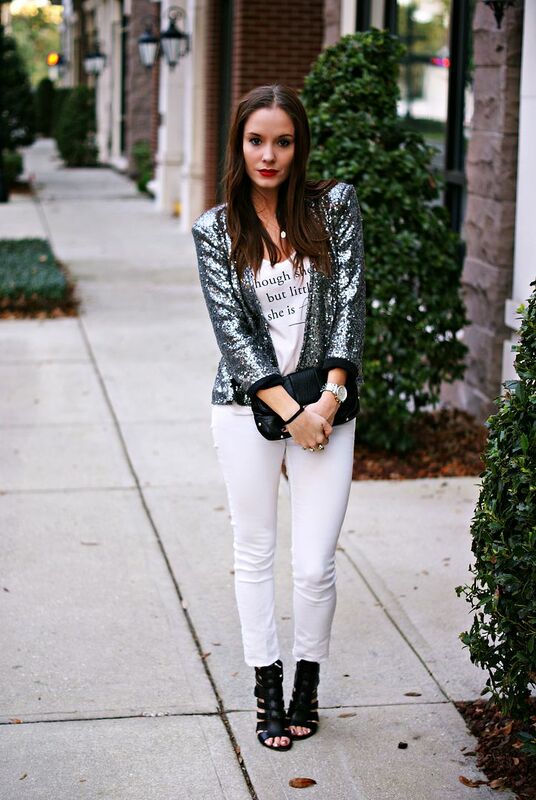 I'd say I broke the cardinal rule of white after Labor Day but I love the winter white look and I really don't think that's much of a rule any more so I broke out my white skinny jeans and a fun graphic tee to go with my sequin blazer. There's just something fun about dressing up and otherwise casual outfit that makes me happy! I topped off my look with my super comfy Sam Edelman chunky heels and of course a bold red lip! P.S. Isn't this the cutest little bottle of Moët?? What are you wearing out for NYE? That jacket is so adorable! The perfect statement piece for NYE! Love that jacket! And I am loving white denim year around as well! So so fun! 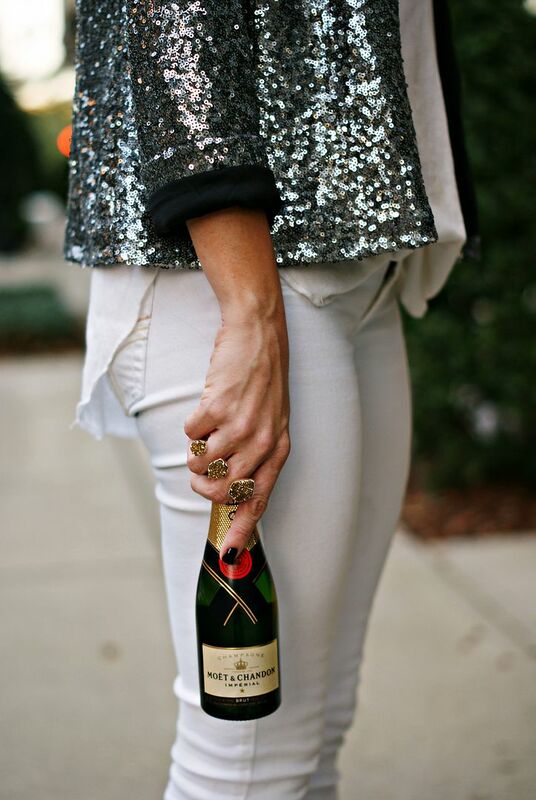 I always love a little sparkle and that is perfect for NYE! I LOVE this blazer and how you paired it with the white! Those shoes are also SO fabulous! I wore this sequin blazer from Shein on Monday! Isn't it fabulous?! So perfect for NYE! 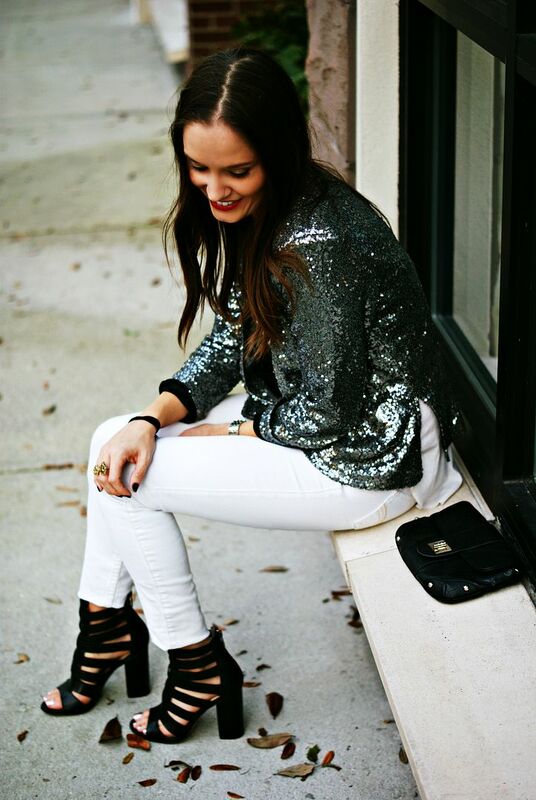 That sequin blazer is too perfect! I can't believe it's from SheIn! Love it paired with the white too! So fab! perfect outfit for NYE. you GOTTA have sequins. it's a must, right?? love it. by the way, miss your visits on my blog. hope your 2016 is full of even more adventures! Love! I have sequin blazer and anytime I wear it I instantly feel festive! Sequins are a must on NYE! Love it paired with the white jeans! Happy New Year, girl! That blazer is perfect! NYE = sequins. Always. Absolutely LOVE the sparkly blazer! 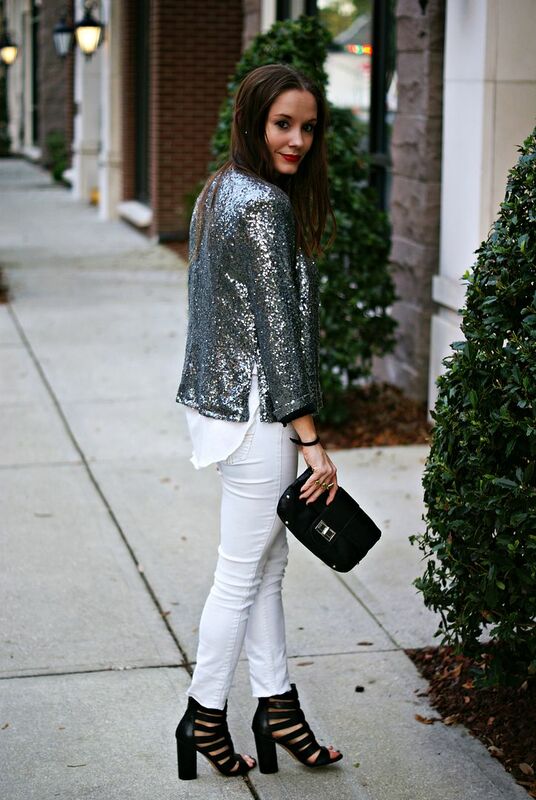 It's such a fun and different way to wear something sparkly for NYE! I totally agree with you about being able to wear white after Labor Day! I think the white looks great with the blazer and your red lips. And yes that mini bottle of champs is the cutest! Hope you enjoy your time off this week! The blazer is gorgeous and perfectly paired with white jeans! Love the color and all that sparkle for NYE. I'm definitely looking forward to bringing out my sparkly outfits tomorrow. 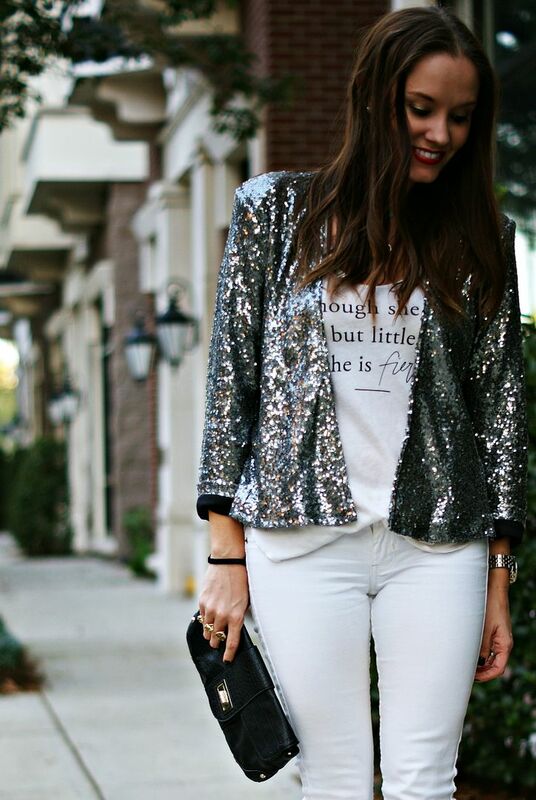 That sequined jacket is so cute and fun, and perfect for NYE! Such a great look for NYE, lady! Loving that you broke out the winter white. Wow- that's a beautiful statement piece! Hope you have an amazing NYE!! I am totally more into low key myself. This look would work for any occasion since it's jeans with a fun blazer. That is a great piece from SheIn. This outfit is perfection! Loving that jacket!! The mini champagne - I love!! Love all the sparkles!! you rock the sparkle! such a chic look! Cute and affordable outfit, love it. Happy New Year! This blazer is absolutely amazing! Love it so much!